Preformed 4-in. outlets allow easy multiple connection of Mole-Pipe Female adaptor or 4-in. PVC pipe (using PVC Glue). 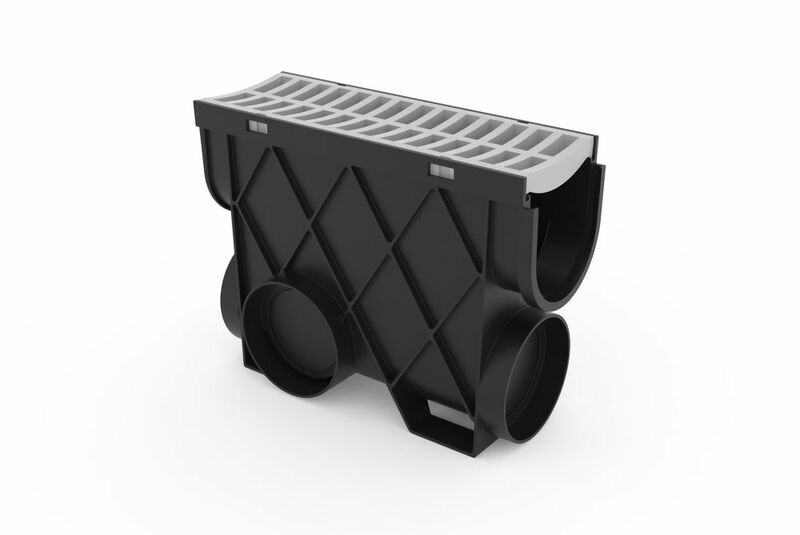 Storm Drain Inline Catch Basin Complete With Portland Grey Grate The Storm Drain complete drainage system is easy to install and allows maximum flexibility in solving your drainage requirements around the home or light commercial applications. The systems design allows maximum flexibility in length of channels, corners and intersections. You can connect Storm Drain to Mole-Pipe or 4in. stormwater pipes with bottom or end outlet, Inline collection pit, and prevent leaves or other debris clogging pipes or waterways with the Leaf Guard. Storm Drain Inline Catch Basin Complete With Portland Grey Grate is rated 5.0 out of 5 by 1.